Allegedly, Lance Armstrong positively channeled his deep-seated anger for his dad — who deserted him as a child — into cycling as fast as he could and excelling whenever he’d race. Tom Brady, the stellar New England Patriot quarterback, wasn’t selected in the NFL college draft until the sixth round. It has been observed and it appears that Brady effectively channeled his deep feelings of being disrespected, as well as his feelings of resentment and anger, into showing all of his detractors how very wrong they were about his ability to make a major impact in the NFL. What Lance Armstrong and Tom Brady have in common is that they appear to have used their anger to fuel them to reach extraordinary heights in their professions. We all “get angry.” When you are making a life choice and your very best judgment, along with your reasoning and evaluative processes become clouded, dismantled, or hijacked by your anger/rage, the choice and action you make and take, respectively, may well not be the ones that are truly best for you and/or your career. First and foremost: DO NOT make an important decision or choice when you are overcome by anger! Always, stop, cool down, and, as they say, “take the pause that refreshes.” Additionally, DO NOT opt for an immediate, emotional quick fix, response, or retaliation, such as unthinkingly and destructively lashing-out. Oftentimes, we opt for short-term, anger-assuaging satisfactions, but in the big picture of our lives and careers, these reflexive, emotion-generated reactions are counter and highly detrimental to accomplishing what we truly want for our lives and/or careers in the long term (our “Gold Ring Dreams”). ALWAYS strategically identify what you truly want in and from the choice you’re going to make. This means that you must know what you truly value the very most before you make your choice. This way, you will make a well-thought-out choice that reflects and effects your most treasured values and goals. If it is appropriate, try to truly understand where the other individual who is pushing your emotional buttons or evoking your anger is coming from. Strive to see things from their point of view. Chat with the person in issue, in an open and non-defensive manner. Oftentimes, learning where others are coming from brings understanding, as well as sympathy/empathy, which can diffuse and thereby lessen the strong energy charges generated by your anger. The most positive, beneficial outcome(s) that you will secure because you took the requisite time to strategically choose – anger free - the most constructive course of action. Your takeaway here, is that there will be times when you will be angry. What you want to do in these instances, is to not emotionally react in these situations, but to instead, strategically and constructively choose your actions. As Lance Armstrong and Tom Brady allegedly have done, channel the potential anger-generated, negative energies that you experience, into positive life and/or career-enhancing endeavors – thereby using your anger as your valuable ally! The sweet result may well be that you will attain life and/or career Gold, as well as gain (increased) feelings of high self-esteem, self-worth, and the core-confidence to achieve your most cherished goals. 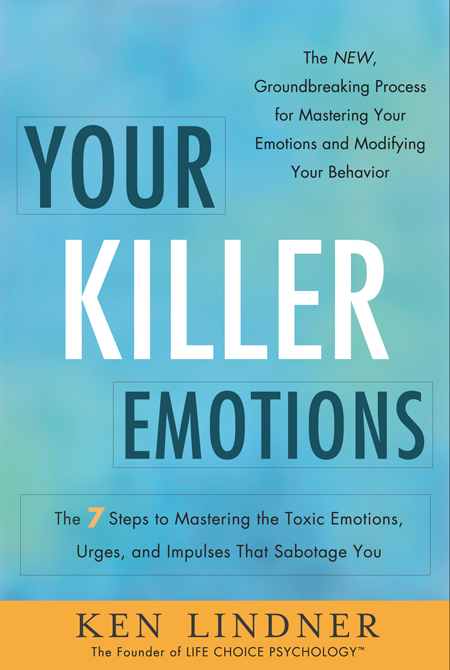 Your Killer Emotions is available on www.amazon.com and www.bn.com! 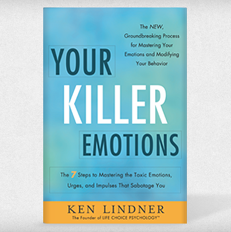 Buy Your Killer Emotions today on Amazon or at Barnes & Noble.